Dual monitors are great for multi-tasking! However, choosing a table specifically for such purpose can be daunting. A lot of desks in the market are not designed with the thought of holding multiple monitors in mind. Especially while the trend is towards simple, small and minimalistic designs. The bestsellers are in fact those that barely accommodate one laptop with some accessories. Never fear! 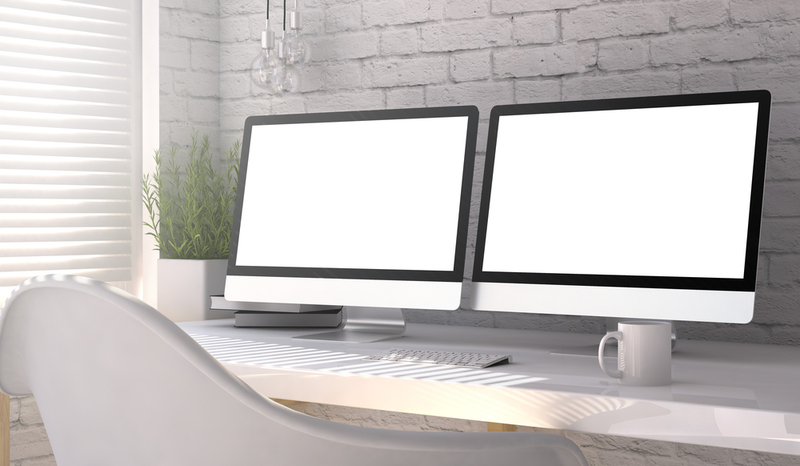 There’s a growing market for dual monitor desks. You don’t have to be concerned with the price either. First, you should ask yourself some hard questions with regards to the design of the desk. Do you need a VESA mount setup? How many wires do you have? Are you aiming to go wired or wireless? How are you going to place your gaming equipment? Are you planning to have put on your table loosely or mounted? Little holes called grommets are useful for your wires. Then you have to choose what kind of desk you want. Do you want a wooden material? Or would you rather have it plastic or PVC? Wooden ones are the usual favorite. They are usually durable and a lot of customers love the look of oak or pine. The only drawback is that they can be pretty heavy to move around. You may want to choose those with wheels. Glass is a pretty rare material to be used as a computer desk. It’s messier, too. Scratches and finger prints tend to linger even after clean up. Although they are generally supported by a steel framework, glass should be your last bet. This especially true in a house with young children. PVC and Steel usually go together. Steel composes the base material for such times. The PVC may be more of a coating. The advantage here is that they are lighter. In addition, they are easier to move around than wooden ones. The next thing to consider the ease of assembling the set up. Usually, companies have tried to improve this by providing simple step-by-step instructions and lessening the number of parts. This mostly works. But if you rather ditch this process, you may appreciate a smaller table for your computer. Then there is the issue of space it will occupy. 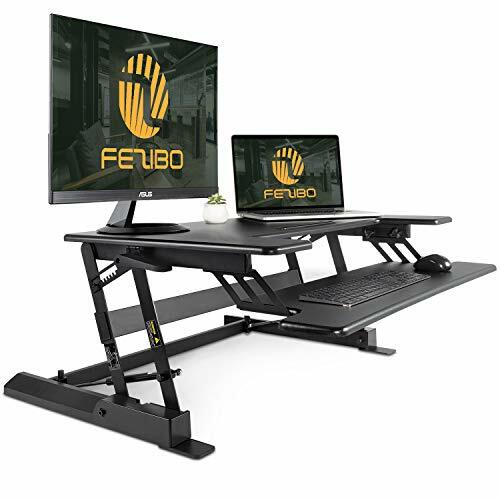 Gamers tend to use this type of desk in a room of their own. Still, they have to make sure that everyone in the house, including their partner, mother or die hard cleaners are willing to put up with their bulk. Start by getting the exact dimensions of your corner or room where the desk is going to be placed. Generally, of course, the bigger the desk, the better for most. Gamers will be happy to be able to place more than two large monitors, loudspeakers, and keyboards into one huge surface. Secretaries will also be able to arrange more efficiently with more file organizers. The next most important thing to consider is the amount of storage space. You will not be needing more then four drawers, of course. But it will help if your desk comes with a CD or DVD rack, multiple compartments for your various equipment, and maybe a cabinet to keep your CPU. Functionality is great but you need to organize stuff. This will make everything better for you. It will cut down on the time you consume by looking for anything you may need. Get more benefits from getting a well-researched desk with getting the right chair and the proper lighting. Your chair should be compatible with the desk in terms of height. It should also have some user-friendly features, such as the nice way it will support your head as you lean backward. L-shaped, or corner desks, are very convenient for switching from one device to another. It may help to prevent that stressful crick on your neck. 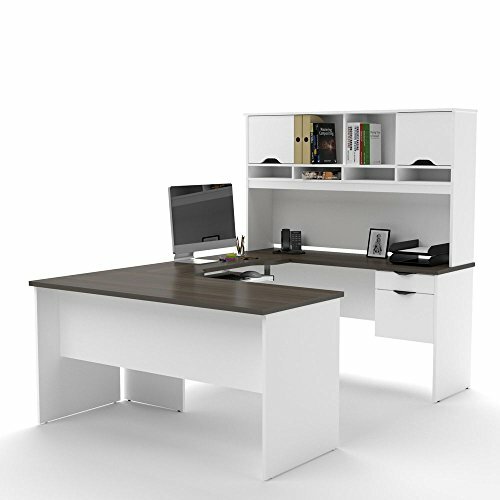 One of the wonderful examples for this type of desk is the Walker Edison Soreno 3-piece Corner Desk. It is outfitted with a separate compartment in the middle. The legs are fixed to give the X look. 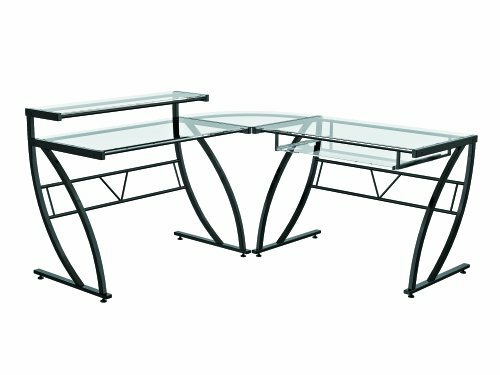 Materials include tempered durable glass and a steel framework. 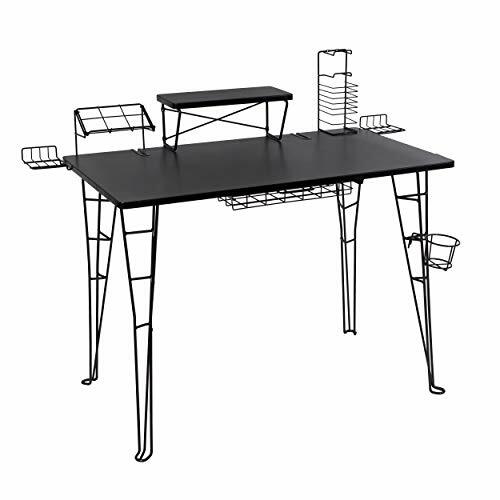 Otherwise known as compact desk, this one will house a lot of equipment within reach. The second monitor can go on an elevated area above the main surface of the desk itself. You can have the option of simply mount two twenty to thirty inch monitors alongside each other in the stand. Then you have the very functional trays and shelves to place your speakers, hang up your headphones and even your drinking cup. Check out the Atlantic Gaming Desk as one of the best models for this design. 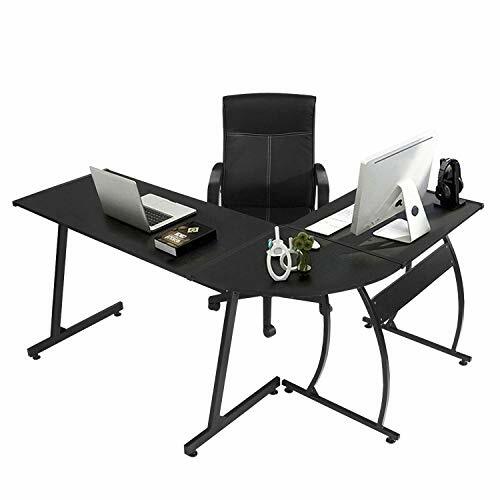 Size: L55" * W23.7" * H29.5", provides large working space. Firm Material: panel material is E1 solid partical wood with high resistance on scratch & friction. These are best if you are looking more for great savings. They are also good if you do not need to place more than the dual monitors, a keyboard and a mouse. Just place your loudspeakers and CPU beneath the table. Go big, sturdy and spacious with this type. 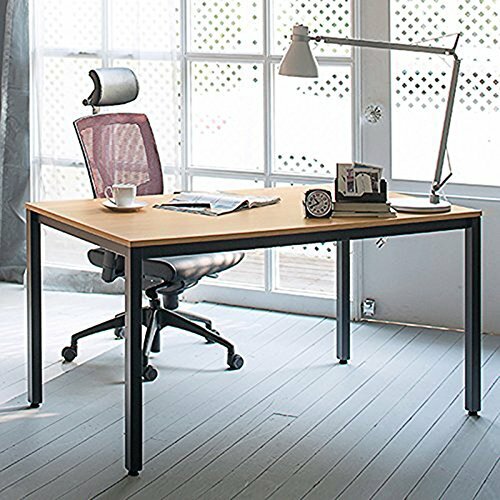 Try the Bush Furniture Series A 72-inch desk for size. You can go all out with this desk design. Cash on some serious buck with Bestar Innova U-Shaped Workstation. It’s heavy and it will occupy some considerable space. Yet, you can’t go wrong with the entire classy bossy look. Some of the biggest advantages to this type is that it includes a lot of storage space. 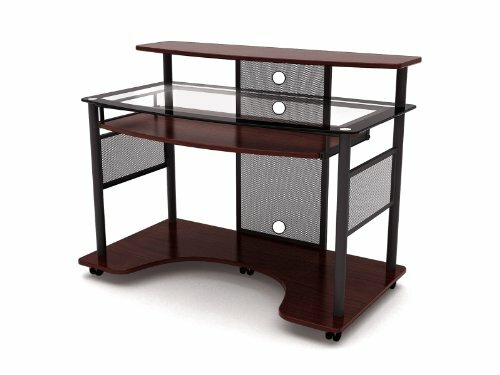 You can also consider computer desk for 2 people. Naturally, since they’re built for 2 people and 2 computers, there will be plenty of room for your dual monitor set-up.